Be patient. And don’t worry too much just yet. That’s the advice of former prime minister Brian Mulroney for those wondering what Donald Trump’s presidency will mean for this country. “I know you’re wondering how Canada will fare under the Trump administration,” Mulroney said at FarmTech. “I’ve had the privilege of knowing both Hillary (Clinton) and Donald for 25 years, and the unpredictability he is showing is a side of his personality that I have not seen before. 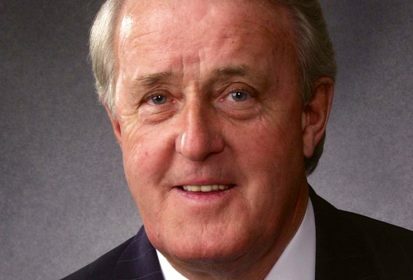 Mulroney helmed the Canada-U.S. Free Trade Agreement three decades ago and negotiated the North American Free Trade Agreement with Mexico five years later. But Canada also needs to be vigilant in safeguarding access to the U.S. market, he said. Trade agreements have become easy targets for Americans frustrated by the slow recovery of their economy. That ire isn’t directed at Canada, but “we should do everything to make sure we don’t become a target accidentally,” he said. He likened the reaction to the early days of Trump’s tenure to the initial negative attitudes towards president Ronald Reagan. “Don’t take in all the stuff you see in the news at night and conclude that those people know what they are talking about. Give him the benefit of the doubt,” he said. Mulroney said he used that approach when negotiating trade deals with both Reagan and president George Bush Sr.
“The key is to find avenues of common ground and common purpose while managing differences — in a relationship this complex, there are bound to be differences,” he said. Mulroney spoke of the positive benefits of the free trade deals, including a 300 per cent increase in trade between Canada and the U.S., and increased job creation in both countries. The two countries’ acid rain treaty was also a landmark agreement and set the stage for future ones, he said. But he urged a go-slow approach to environmental measures, such as the carbon tax, that would undermine Canada’s competitiveness. Instead, Ottawa should be persistent and rigorous about defending access to the U.S., and in reminding American leaders that two-way trade flow benefits both countries. The agreement with the European Union, once ratified, will offer significant promise to Canadian agriculture. Canadian exporters face high tariffs on agricultural products, but there is duty-free access for beef, pork, and bison along with preferential access for processed food products and beverages. Along with planning for a post-Brexit agreement with the U.K., Canada should be a “leader instead of a laggard” in seeking out trade deals. China is now Canada’s second-largest market for agricultural goods, and now comprises 16 per cent of Canada’s total exports versus five per cent in 2008. Don’t “wait for customers to come calling at our door,” he warned. With the Trans-Pacific Partnership dead in the water, Canada should strike trade agreements with countries such as Japan, Malaysia, and Vietnam, he said. Mulroney also said Canada should consider dismantling its supply management systems for dairy and poultry in order to facilitate trade deals. The former prime minister fought to preserve supply management during NAFTA negotiations but in recent years has called for it to be phased out.